Malibu was buzzing this week with the news that Malibu residents and political activists Rob and Michelle Reiner, working with the Preserve Malibu Coalition, have formed an organization called Save Malibu and submitted a ballot initiative to curb commercial development and expansion in Malibu. “We filed the ‘Your Malibu, Your Decision Act’ because that [small-town] character stands to be destroyed by massive new commercial developments – developments that we think the voters of Malibu should have the power to approve or reject,” Michele Reiner said in a statement to the media. The “Your Malibu, Your Decision Act” includes a 30-percent limit on the maximum number of chain stores in each Malibu-area shopping center and would require a citywide referendum on any development in excess of 20,000 square feet. Current chain stores would be grandfathered, but would require a conditional use permit if they seek to expand or relocate. 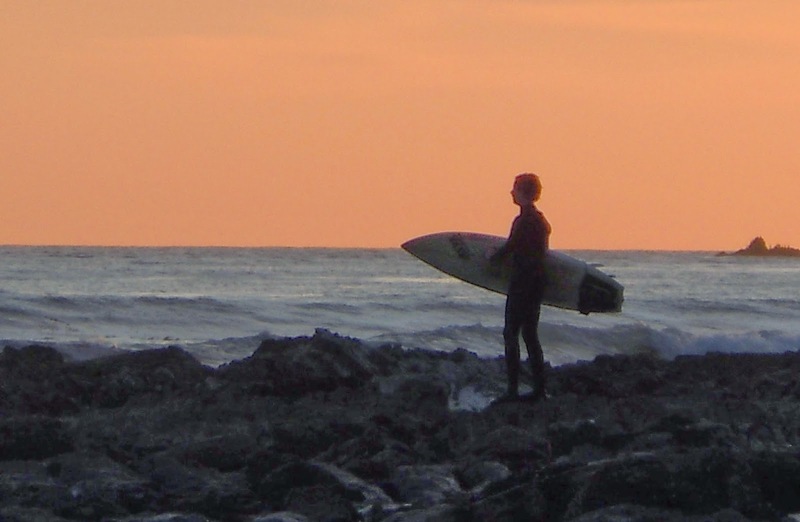 Save Malibu is seeking to place the initiative on the November ballot. An early real estate brochure boasts: "The entire beach property has been carefully, but moderately restricted. Necessary business units will be conveniently, but not conspicuously located." Many Malibuites would still like to keep it that way. “Previously, the proposed ordinance (which the city council had stalled around on, practically studying it to death) was overwhelmingly opposed by most of the commercial landowners, who threatened all sorts of litigation if the ordinance was enacted,” Arnold York, publisher of the Malibu Times, wrote in an editorial this week. “Well, the commercial landowners and developers may have overplayed their hand a bit because there is a new group who have just presented to the city a very thorough ordinance, obviously drafted by professionals and seemingly legally vetted, which means there is some significant money and expertise behind the push,” York wrote. “It’s clear this is going to be a battle for the heart and soul of Malibu, and it’s going to be played out at the polls this November," he concluded. The “Your Malibu, Your Decision Act” contains two components. Under the first, all major shopping center development and commercial or mixed use construction over 20,000 square feet would require a citywide vote. This would include all future projects that do not already have permits. The second component would place a 30 percent limit on the number of chain stores permitted to operate in Malibu shopping centers. It’s not the first time Malibu residents have been driven to the polls to enact change. Mostly, Malibuites like to be left alone. That’s why most people live here, the real, 4000-5000 year-round residents, not the other 8000 who have second (or third or fourth) homes here for weekends, or property for investment. For the “real” residents, it’s simply worth the inconvenience of bad roads and periodic natural disasters for the pleasure of living near mountains, ocean, wildlife, quiet. "Your front yard is the Pacific Ocean." 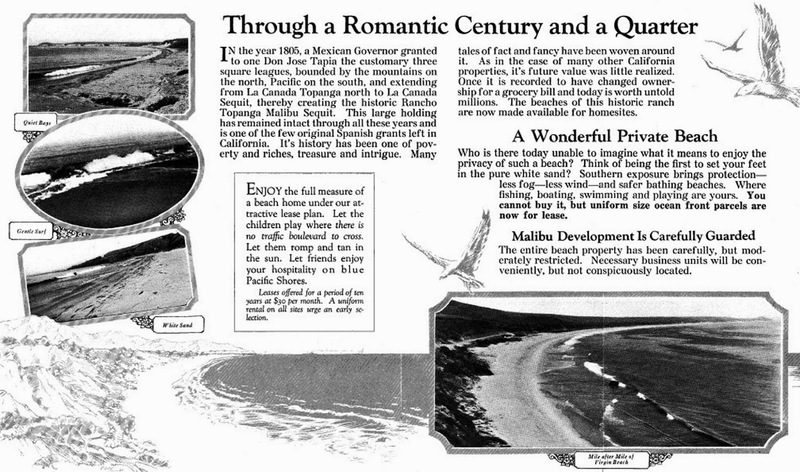 This ad from the early 1930s still sums up the real appeal of Malibu. It takes something major to shake most residents out of their self-imposed isolation. Measure M, which involved development on what is now Legacy Park, was one occasion. Cityhood was another. In fact, it’s ironic that the announcement of the formula retail ordinance initiative came just weeks before the city’s 23rd birthday on March 28. 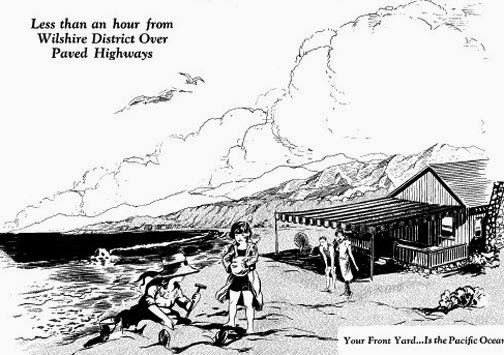 It took three tries to pass the Malibu cityhood initiative: in 1964, 895 yes votes were defeated by 1,161 noes. In 1976, there were 3498 yeas, and 3,681 no votes. Finally, in 1990, Measure Y passed with 4,682 yeas, 892 nays. A judge had to order the county to permit the third election to take place. My parents moved here in 1969. They joined the fight to pass the Coastal Act and create the Santa Monica Mountains National Recreation Area, worked to save the Point Dume Headlands, and my dad was active in the battles to prevent sewers, get truck traffic off PCH, and stop plans for off-shore oil drilling platforms and a six-lane freeway in Malibu Canyon. They just missed the fight over the nuclear power plant in Corral Canyon. Some of my earliest memories are of packed living room meetings, thick with cigarette smoke—local activist Faye Hove was a chain smoker. So was Dotty Linke, who used to take notes using shorthand, all loops and hooks and completely indecipherable now. My mom, who wasn't a public speaker, would help my dad with speeches or letters on weekends and in the evening, the table in the dining room covered with papers. 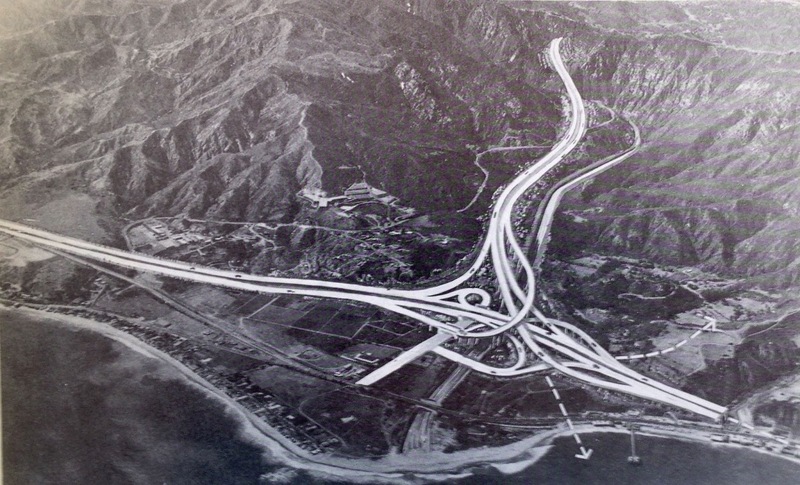 An artist's rendering of the six-lane freeway proposed for Malibu Canyon that helped convince many Malibu residents that it was time to part company with the county. For my dad and many other activists, cityhood was the ultimate goal, the best way for the beach and the mountains to be protected from the massive development desired by the county. Everyone worked together. People piled into buses to protest at downtown meetings. They didn't give up during months and years of endless, repetitive, frustrating, boring bureaucracy and sometimes deliberate obfuscation. My dad used to call "wheel spinning." It was a brutal, uphill struggle against a Los Angeles County Board of Supervisors determined to bend Malibu to their will, backed by a powerful lobby of developers armed with seemingly unlimited financial resources and influence, but despite the odds, the fight was finally won in 1990. Supervisor Deane Dana is on record in 1989 recommending that the board continue to attempt to "bury and delay the process." More than half of Malibu was astonished to find that Dana and Supervisor Pete Schabarum didn't actually have horns and a forked tails, not that anyone could see, at least. "There is no other city that was ever formed that had such a burden," Supervisor Kenneth Hahn said in December of 1989. "I've never heard of or seen such confusion." An editorial on KNX Radio in March 1990 recommend that the county, "Stop trying to foil the Malibu cityhood effort. You've had your day in court. 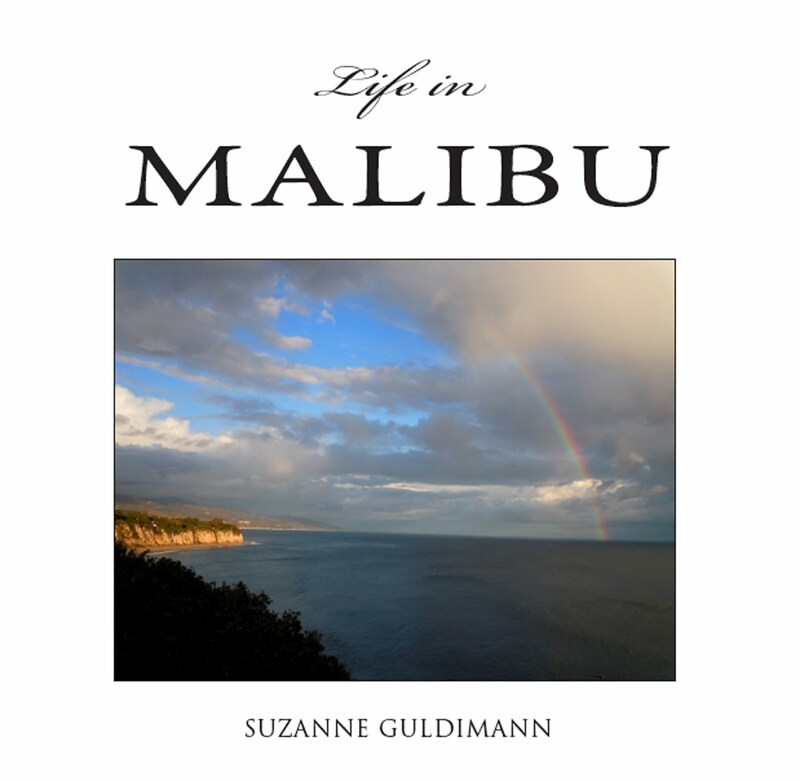 It's time Malibu had its day at the polls." Suporters of the Malibu Cityhood Initiative gather on the corner of Webb Way and PCH to urge passers-by to vote yes on Measure Y in this Malibu Times photo reproduced in the City of Malibu's Independence Day Commemorative Journal, March 28,1991. "Hooray for Malibu, Mayor Walt and all of the people who have worked so hard to make cityhood happen," wrote Ann Cornelia Andes-Dixon in the 1991 Malibu Cityhood commemorative program. "My children and I have been involved in this fight for 23 years, I'm so glad to be here to see the dream come true. Happy Birthday, Malibu!" Another 23 years later, Ann Cornelia's daughter Dru Ann signed the "Your Malibu, Your Decision Act," along with the Reiners and longtime Malibu activist Carol Moss. The "Your Malibu, Your Decision Act" is currently being reviewed by the city. It will then need to garner enough signatures to place it on the November ballot. Whether it passes will be up to the people of Malibu. It doesn't require divination skills to foresee the developers attempting to blitz the initiative with negative advertising or trying to put together a poison pill initiative to neutralize it. Fortunately for Malibu, protections were built into the first development plans when the ranch went on the block in 1940 and no amount of greed and grandiose plans have ever been able to entirely undermine them. Plans for converting the historic Malibu Ranch into a private empire for business leaders of Southern California were being mapped out today by Louis T. Busch, past president of the Santa Monica Bay District Realty Board, following his appointment this week as general sales agent for the Marblehead Land Co. With 17,000 acres of land to sell, and 23 miles of ocean frontage thrown in for good measure, Busch confirmed reports that he is building up a sales organization that will strive to develop the rolling hills of the Rindge property to their best and highest use. Two small neighborhood service centers, not destination shopping centers, or high density chain store mega malls, but something in keeping with residential character. Is that something the majority of Malibuites still think is worth fighting for? We'll find out.